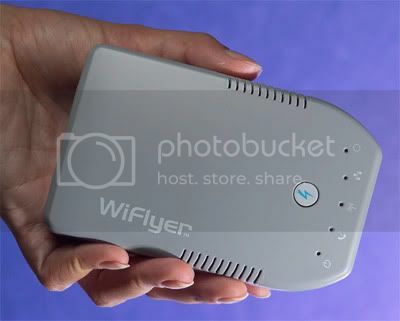 Getting on the Internet will never be a problem wherever you are with Always on Wireless’ WiFlyer WiFi Wireless Router around. Constant Internet users, particularly travelers who document their experiences and trips through online blogs will be rid of connection hassles because you can log on through dial-up, Ethernet, and wirelessly through this beautiful piece of equipment. For dial-users, the WiFlyer has a small button at the top part which lets you hear if you are connecting to the Internet or not. To its left is a volume dial that regulates sound. If you’re using the Ethernet connection, all you need to do is hardwire your laptop to the Ethernet port and see if the LED is lit. Wireless users will know if a connection is availabe if the Wireless LED is on. Once you’ve set up all the externals, you can begin configuring the WiFlyer by accessing the web-based setup page. You have the option to skip this and save this for another time, if you’re busy. But if you’re planning to bring it with you when you jetset to somewhere, sealing your account early on will protect you from potential connection problems and hackers. All you need to do is launch a browser and type in http:/192.168.7.77 and then press Enter. Instructions will follow. If you’re a bit iffy with all the technical jargon, don’t worry; the instructions come in very easy to understand sequences that you don’t really need to be a configurations expert to be set this up nicely. The most important thing, really, is that you can bring this wherever you go, whether you’re about to go 50,000 miles off or just out into your backyard for some fresh air while surfing the net.